You work hard and never have time to take care of yourself. The LBI area has many places That Will Help You Take Care Of Yourself And Relax on Long Beach Island, NJ and the nearby mainland. Massage, Skin Therapy, Face & Body Waxing, Body Treatments, Microdermabrasion, and Bridal & Custom Event Planning. Ocean Club is a Full Service Gym with free weights, weight training machines, cardio machines, swimming pool, whirlpool, sauna (steam room), baby sitting, etc. Only 4 minutes by car from Lorry’s Island End Motel. Lorry’s Island End Motel on Long Beach Island, NJ (LBI) has been a Member of the Southern Ocean County Chamber of Commerce since 1990. 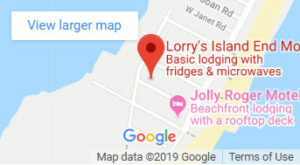 Lorry\’s Owner Thanks You For Your Lorry\’s LBI Motel Vacation!